New Kingdom, that sublimated a lot. Considered a true work of art, due to the regularity of the form, the epic poem Os Lusíadas, of Luís de Camões (1524-1580), from 1572, expressed the acts of heroism and bravery of the Portuguese people, looking for expansion of the empire, at the time of the Great Navigations. The curiosity fomented great changes in this period, showing that the human soul was discontent, There was dissatisfaction and a search for improvement. The Culture followed this evolution that never ends and, the improvement of the character is within, from a refining, by taste. The art is embedded in Culture, since “there is not a better cognitive way of mapping the heart complexities than the artistic culture” (EAGLETON, 2005, p.76). Although there is much for the mankind to be changed, in order to reach the perfection, the Renaissance, showed great changes, especially, in the area of Culture, perhaps even as a reaction to the difficulties that accompanied the Middle Ages. The Renasissance is considered, the period between the 14th century and the first half of the 17th century, though there is not an agreement, because some features already sprouted changes at the end of Middle Ages. For the History, this period was marked as the end of the Middle Ages and the early Modern Period. Some still subdivided into Trecento (14th century), a period of transition; Quattrocento (15th century), the Renaissance heights; and Cinquecento (sixteenth century), when the Mannerism and the Baroque were beginning to emerge. 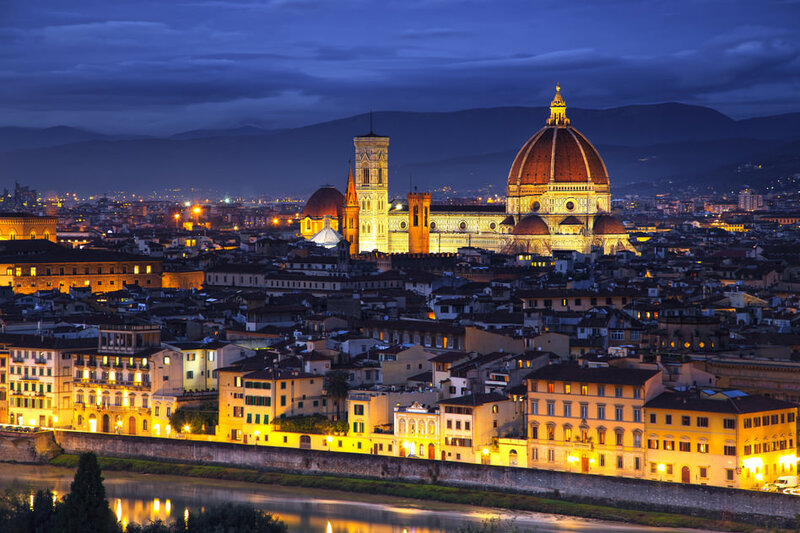 The city of Florence, Italy, was the birthplace of the movement that then dissipated in Genoa, Venice, Milan, Rome and other European countries. Fig. 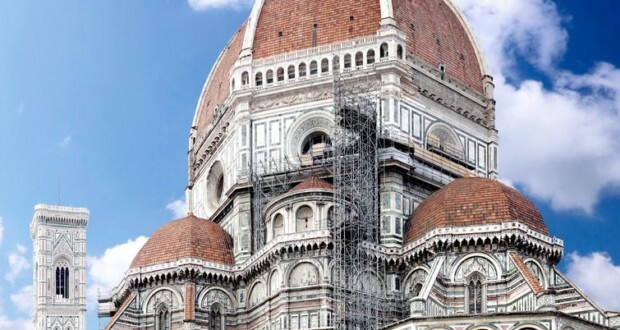 1 – Church of Santa Maria del Fiore, Florence, Italy. Image at dusk. Photo of StevanZZ. The wounds that left marks in middle age man shaped the Renaissance man with an innovative sense. The humanist thought rose, as a form of opposition to theocentrism 1 of the Middle Ages. The Religion began to give way to reason and scientific thought. The classical culture and the Greco-Roman ideals that had never been completely forgotten, resumed now, with great force. Greek philosophers and Latin authors were translated and studied. The Renaissance was also the period of the great voyages of discovery, what changed the man's knowledge about the planet itself. And there is no doubt that the invention of printing, in 1455, by the German inventor Johannes Gutenberg (1398-1468), was of fundamental importance for the dissemination of knowledge, although the illiteracy rate was still high, in the period. The European cities, that dawned, as major centers already in the 12th century, started now a full development, since the debts of feudal lords led many rural workers, from rural to urban areas. The growth of these centers stimulated even the coming of the richest peasants. With this, the social structure was modified for the new classes that arose, as traders, craftsmen and owners of business establishments. Basically, Europe, was formed by commercial cities, such as Genoa and Venice, that sheltered ports and were responsible for the trade; the cities of artisans and tissue industries, as Milan and Florence; and cities like Rome and Naples, centered on the judiciary, in banking and taxation. Italy prospered as one of the largest urban centers. The growth of cities and the population encouraged the production of large-scale goods, the need of labor and new forms of housing. The cultural landscape was changing and the patron figure emerged with the rich lords, that is, nobles, and bourgeois, who wanted, to searh for prestige, and showed interest in Art, in Culture and in Science, what was done by the Church before. The artists, poets and philosophers were housed in homes of those patrons, that protected them, gave them food and clothing. Advantageously, they received payment of the correct working and they had no need of a workshop; on the other hand, the disadvantage, they lost freedom and could only accept orders from outside, with permission of his patron. Fig. 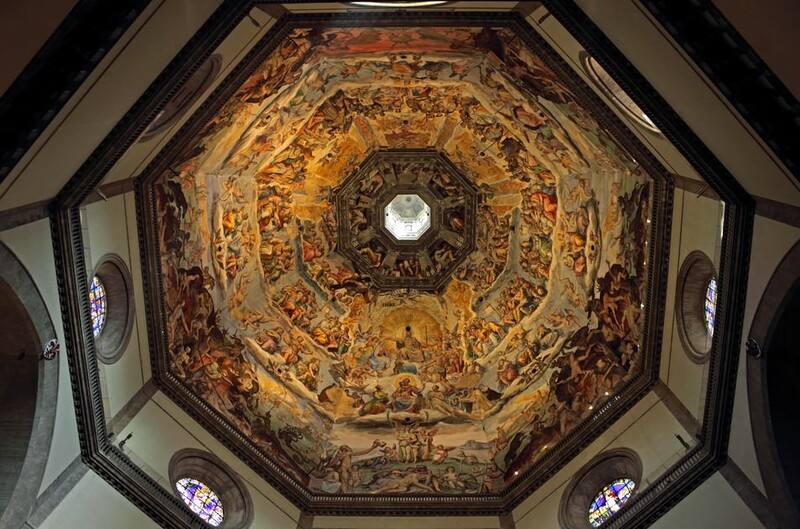 2 – Church of Santa Maria del Fiore, Florence, Italy. Photo of Ivantagan. The scientific and rational thought that accompanied the Renaissance man was clear in his Art. The Architecture, still connected to Christianity, sought antique elements of Classical Greece and Rome, overcoming the Gothic verticality. 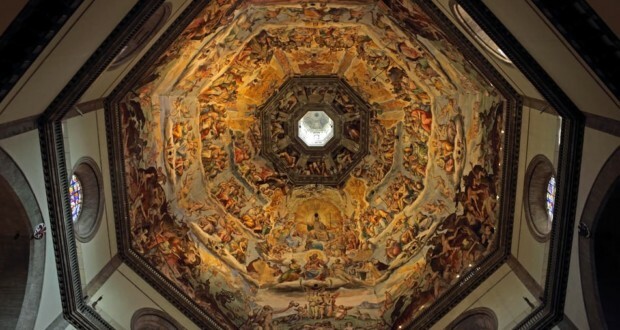 The field of mathematics and geometry led the artist to the proportionality, as can be seen in the Santa Maria del Fiore church (Figures 1 to 5), in Florence, Italy. The Basilica, built between 1296 and 1369, the sculptor and architect Arnolfo di Cambio (possibly 1232-1310). 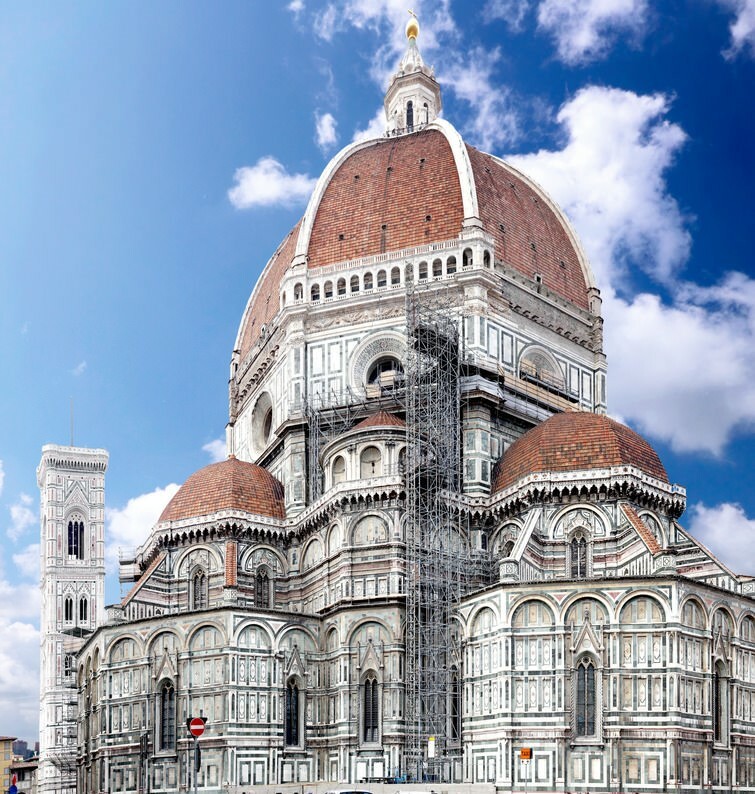 In 1420, the architect Filippo Brunelleschi (1377-1446), based on the structure of the Roman structures and Panteon, designed its dome 2, considered the world's largest and an architectural challenge, for the period. Between its two internal and external domes, there is a curved staircase, used for inspection and repairs that is currently open for visitors. The arches are 23 meters tall and the structure, is wood-free and iron-free on the basis, it was done by a system of concentric rings seated on the octagonal base. Its facade, finished only in the nineteenth century, was harmoniously decorated with colored marbles and sculptures, in neo-Gothic style. Fig. 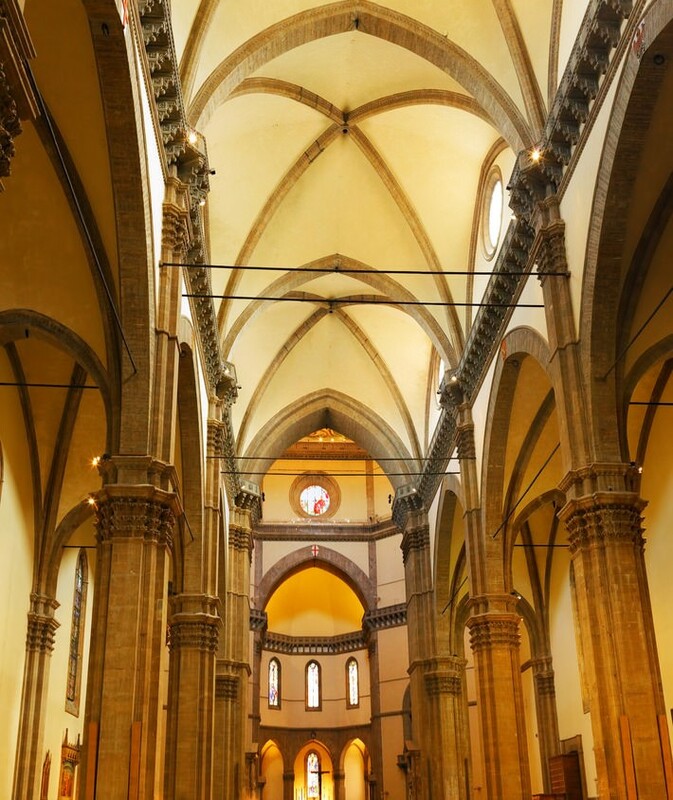 3 – Interior of the Church of Santa Maria del Fiore, Florence, Italy. Photo of Ivantagan. The sculpture had as its greatest representatives Donatello (1386-1466), Andrea del Verrocchio (1435-1488) and Michelangelo 3 (1475-1564). 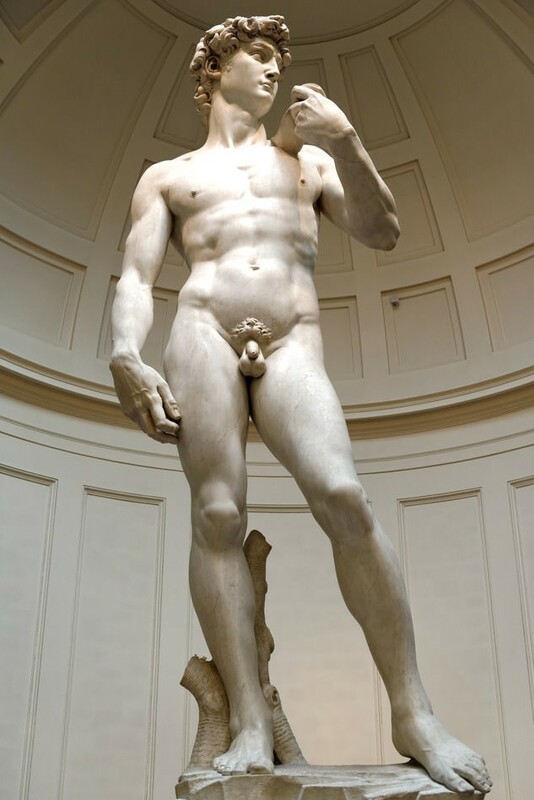 David, the biblical character who defeated Goliath, was portrayed by the three sculptors, but Michelangelo’s (Fig. 6), was considered the most perfect, because of the rich details. His structure of more than four meters tall, shows a young and robust adult, who looks confident and determined. 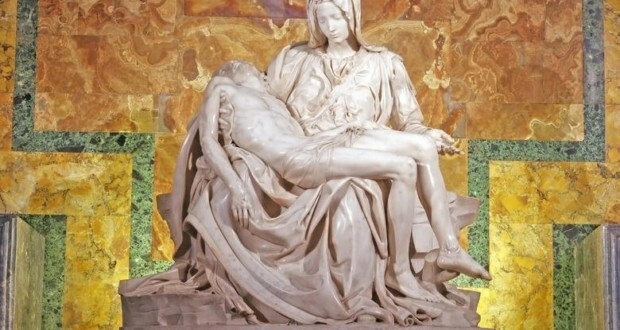 Michelangelo’s Pieta (Fig. 7), was sculpted when the artist was still 23 years old and it is the young mother of Jesus, holding her dead son, in her arms. It calls the attention to the wealth of details, the folds and the fall of the clothing, and above all, the serene expression of Mary's face, despite such pain. The sensation of movement, is due to the fact that the Virgin is sightly ached, as if he could not bear the weight in her arms, and the body is up to fall from her lap. Fig. 4 – Duomo Inside View of the Church of Santa Maria del Fiore, Florence, Italy. Photo of Kirilart. The painting, like the sculpture, presented scientific interpretation of the world, sense of geometry, perspective and mathematics. An important feature of the Renaissance was the use of light and dark, contrast that brought the feeling of volume and approached the Works to the reality. Since the artists could work independent and free from the rigor of the form, heir creative ability outcroped, and allowed each one to develop a personal style. Also in the Trecento, Giotto di Bondone (1266-1337) dared and created a link between the Gothic style and the Renaissance. 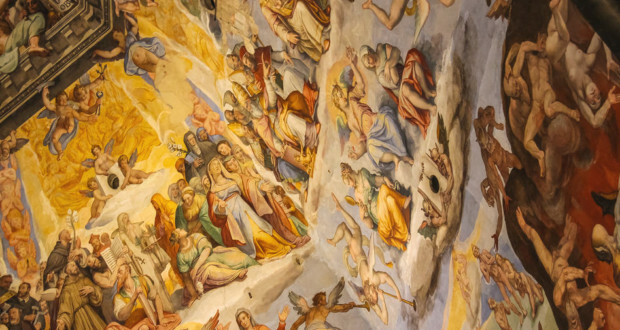 The human figure, appeared in his frescoes, and the Saints, were given the appearance of ordinary people. But it was in the florishing of the Renaissance, in the Quatrocento, that the artists broke with the standards Middle Ages and resumed the elements of classical Greco-Roman Culture, Mythology and started looking for the aesthetic perfection, and through the perspective of anatomy. The Modern joined the Classic. This phase brought to the History of Art eternal unquestionable talents, including, Sandro Botticelli 4 (1445-1510), Leonardo da Vinci 5 (1452-1519) and Piero della Francesca (1415-1492). And among the most representative paintings of the Renaissance, there is Gioconda of Leonardo da Vinci (1503-1506); and the works The Birth of Venus 6 (1485), Spring (1473) Botticelli, was commissioned by the influential Medici family, Florence (QUEIROZ, 1995, p. 95). Full of mythological elements, the scene of Figure 8, work of Titian, shows the goddess of beauty, Venus, in her bath, with Cupid. At the Renaissance manner, the image revives the classic model, and takes as an example the Roman statue of the Goddess, which belonged to the Medici family. Graciously, Venus appears to allow her body to be revealed and stares to the mirror, gazing at her own image refleted. The renaissance traices, are on the richness of details, perspective, the light and shadow, and the realistic way the artist depicts the human body, revealing his deep knowledge in painting. Fig. 5 – Duomo detail of the Church of Santa Maria del Fiore, Giorgio Vasari's frescoes (1511-1574) and Frederico Zuccari (1542-1609). Florence, Italy. Photo of Nick_Nick. The expansion of the Renaissance to other European countries, in the Cinquecento, meant the culmination of the period, when the humanistic spirit in Art strengthened, bringing to evidence great artists, such as Michelangelo (1475-1564) and Rafael Sanzio 7 (1483-1520). In this period, the great masters of painting were no longer protected by their patrons, they became wealthy gentlemen and their works had market value. The ability of bringing the Works to the reality and the creative spirit, made the painter be recognized. The Beauty began to be portrayed with a certain solemnity and the human figures, were painted in complex poses, often with twisted body, resembling the Greek sculptures. At the end of that period, the Renaissance was losing strength in Italy, and some artists were beginning to diverge from classical antiquity and the Mannerism dawned. 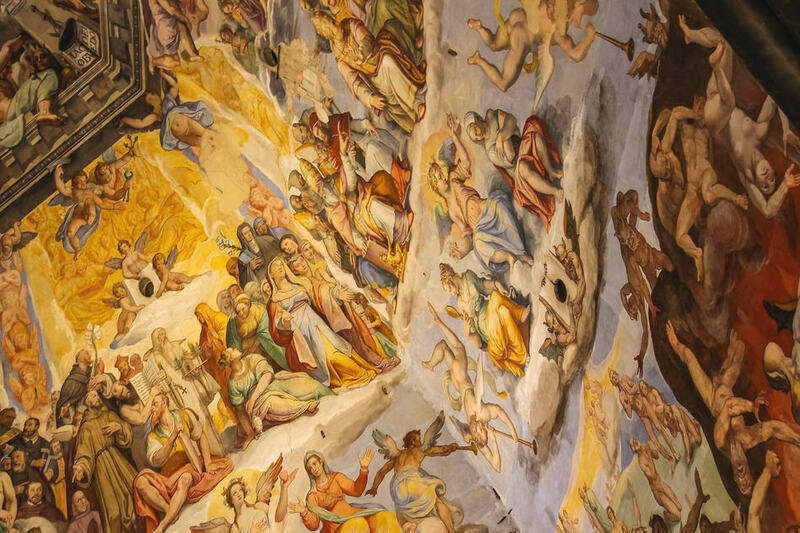 The exaggeration and the negativity that would sign the following trends were already in the work of Federico Zuccari (1542-1609), Ticiano (1485-1576) and the Last Judgment (1537-1541), by Michelangelo. The Italian Renaissance also inspired the European North, where the beautiful Flemish Art flourished. The style, which will be studied in another text, brought to Art History, big names like Dürer, Holbein, Bruegel and Bosch. In their works it can be seen a strong tendency to realism, rich details and aspects of everyday life. An important feature of the Renaissance was the versatility of artists, who worked in several areas, as Bruneleschi, Michelangelo, Leon Battista Alberti (1404-1472) and Giorgio Vasari (1511-1574). And the human genius was well represented by Leonardo da Vinci, an inventor, who went through the fields of Painting, Sculpture, Architecture, Engineering, Mathematics, Anatomy, Astronomy, Botany, Music, Poetry and Science. Fig. 6 – David by Michelangelo, built between 1501 and 1504, Academy of Fine Arts, Florence, Italy. Photo of Leon1234. The Renaissance marked the prospering of knowledge, and brought names like Nicolaus Copernicus (1473-1543), Kepler (1571-1630), Galileo Galilei (1564-1642), Isaac Newton (1643-1727) and René Descartes (1596-1650). The period also coincided with the Elizabethan Era, in England; with Shakespeare (1564-1616) and his tragedies, his plays and his poetry. This was also a time of great representatives of Portuguese Literature, as Gil Vicente (1465-1537) (Play of the Boat of Hell) and Luís de Camões, (The Lusiad). And some of the great examples of philosophical thought as Machiavelli (1469-1527), Francis Bacon (1561-1626) and Thomas More (1478-1535) enriched the period with their knowledge. Fig. 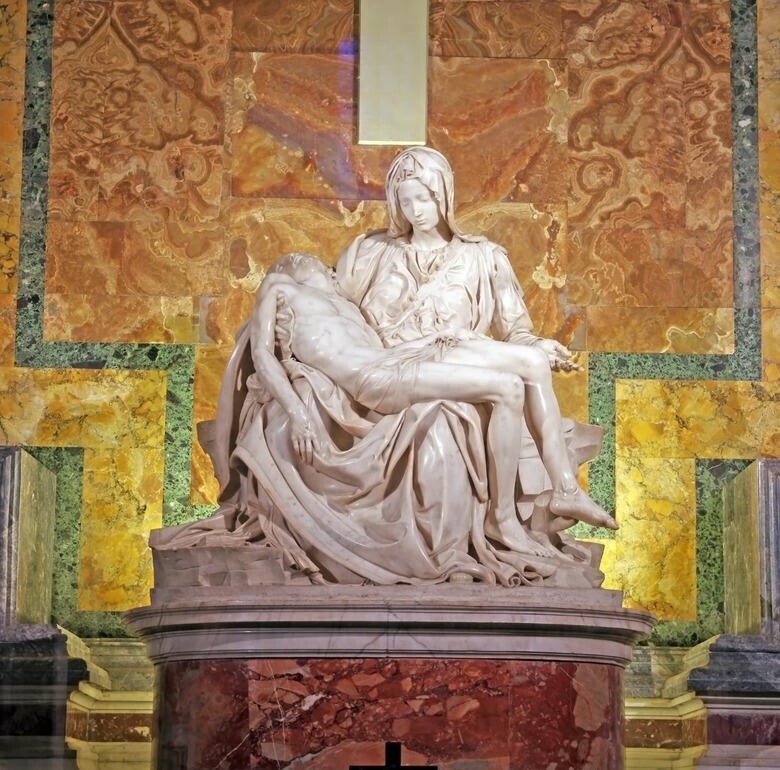 7 – Pieta, Michelangelo, 1498-1499, St. Peter's Basilica, Vatican, Rome, Italy. Photo of Savcoco. The Degli Uffizi Gallery, in Florence, Italy, is the birthplace of Renaissance works. Among the most important Works of the period, there are the Birth of Venus and Spring, of Sandro Botticelli. 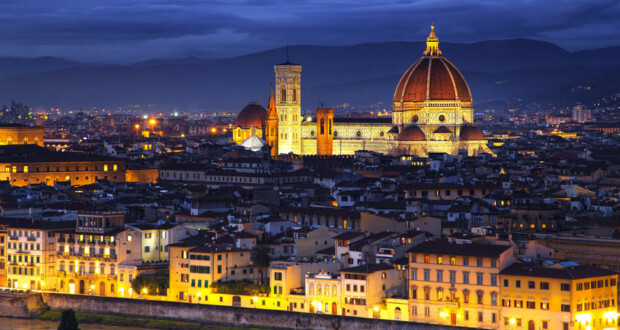 It is one of the most important museums in the world and one of the largest tourist attractions in Florence. In its fifty rooms, there are works of great names like Giotto, Rafael Sanzio, Piero della Francesca, Ticiano, Caravaggio, Dürer and Goya. Although the museum houses a large collection of Renaissance, there are works from various periods, Roman replicas of classic Greek sculptures and Modern Works. The building was built in 1560, by Giorgio Vasari, as a request of the Medici family, and it would be an administrative office. Years later, it was added a corridor that would be connected to the family residence. In 1574 Francesco de Medici turned the terrace into a personal gallery, where he put his collection of rarities, objects and works of art. From then, the gallery was enlarged and enriched. It is also worths to visit the website and take a virtual tour through the rooms. Fig. 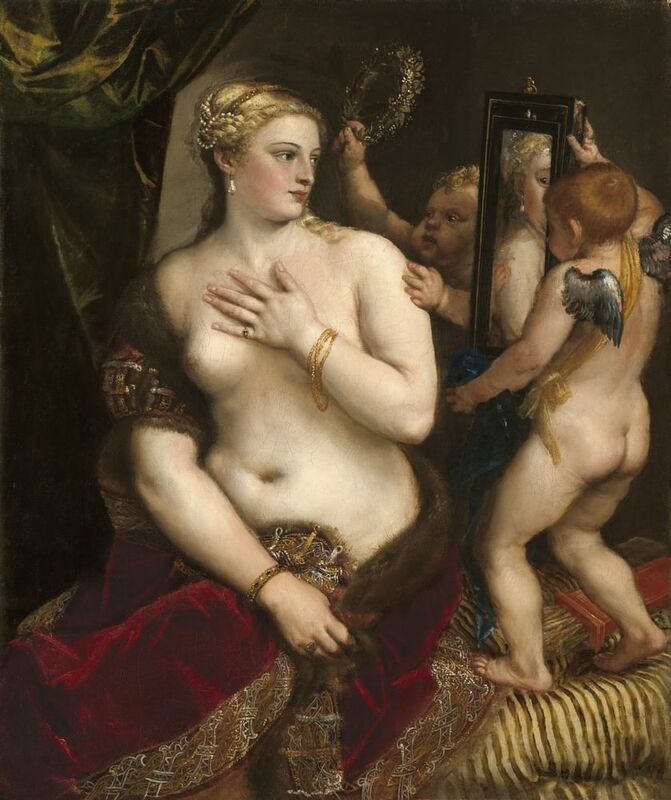 8 – Venus with a Mirror, Ticiano, 1555, Oil on canvas, National Gallery of Art, Washington, USA. Andrew W. Mellon Collection. If things are unattainable… oh! If it hadn’t been the presence of distant stars! 1 Fits here to outline briefly the thought theocentric guided the man of the middle ages, as a conception that God is the center of everything. Opposes, to the anthropocentrism, when there was an appreciation of the human being. The anthropocentric vision does not mean however, the abandonment of religion, but an opening for the valuation of thought and human emotions. CAMÕES, Luís Vaz de. Lírica, Épica, Teatro, Cartas. São Paulo: Editora Moderna, 1980. MORE, Thomas. A Utopia. São Paulo: Folha de S. Paulo, 2010. 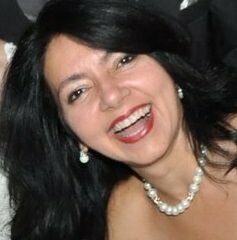 QUEIROZ, Teresa Aline Pereira de. O Renascimento. São Paulo: Edusp, 1995. QUINTANA, Mário. Quintana de bolso. Porto Alegre: Ed.L & PM, 2004. SCHILLER, Friedrich Von. A Educação Estética do homem. 4to. edição. S.Paulo: Ed. Iluminuras, 2002. Fig. 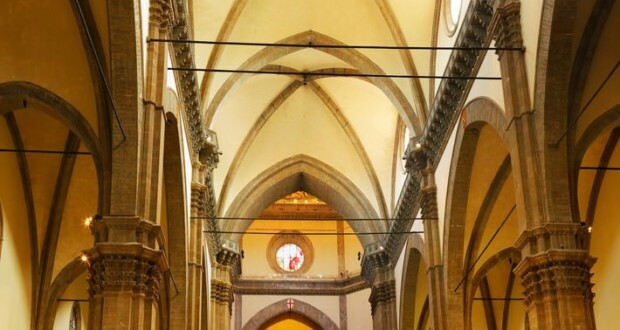 3 – Inside the Church of Santa Maria del Fiore, Florence, Italy. Photo of Ivantagan. Fig. 4 – Duomo Inside view of Church of Santa Maria del Fiore, Florence, Italy. Photo of Kirilart. Fig. 6 – David of Michelangelo, built between 1501 and 1504, Academy of Fine Arts, Florence, Italy. Photo of Leon1234.